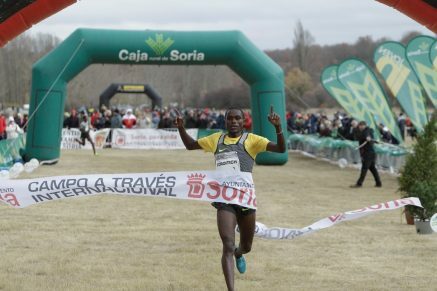 20th November 2016 – Timothy Toroitich (UGA) has earned himself quite a reputation on the Spanish Cross-Country circuit over the past few years and he enhanced that further again with victory at the 23rd edition of the Campo a Traves Internacional de Soria on Sunday. Last weekend Timothy was incredibly unlucky as he was literally pipped on the line by Bahrain athlete Aweke Ayalew at the opening round of IAAF’s Cross Country Permit series the ‘Cross Internacional de Atapuerca’. Therefore, he was determined to leave nothing to chance this week and he slowly ground the field down until he eventually broke clear over the 10km course to take victory in 29:10, 10 seconds clear of the runner. This was Timothy’s third successive victory in Soria making him the first athlete to win here three times.